Orangutans spend almost their entire lives in the trees. They eat there, sleep there and travel by scrambling from branch to branch. 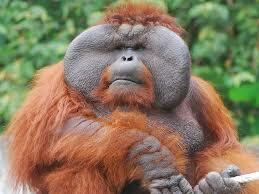 Orangutans live in Sumatra and on the island of Borneo. Orangutans eat mostly fruit, but they also eat bark, honey, bugs and even small mammals. 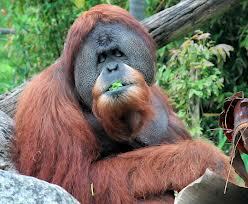 All About Orangutans: Orangutans are apes and mammals. Orangutan babies live with their mothers longer than any other mammals except humans. They don’t leave their moms until they are between 10 and 12 years old. Boy orangutans usually stay with mom longer than girls. Their moms teach them everything they need to know – how to find food, how to protect themselves and how to eat food. Adult males grow pads on the sides of their cheeks called flanges. These pads help them attract a mate. Orangutans have flexible bodies and that’s not all about orangutans. Adult males are big boys! They weigh 300 pounds. Girls are much smaller. An adult male’s arm span is 8 feet. That means the spread between their outstretched arms is longer than your dad—or a small car! Girls start having babies when they are about 16 years old. The babies stay with them for at least 10 years. Mama orangutans carry their babies until they are about 5 years old. Then it’s time for the babies to start walking on their own. 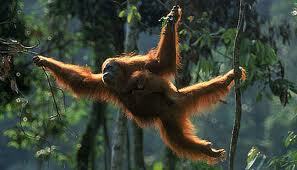 Orangutans have flexible bodies. They can put their legs behind their heads or do other stunts. An orangutan’s favorite food is the fruit of the diurnal tree. This large fruit has a stinky smell and tastes a little bit like garlic flavored cheese. Yuck! But orangutans love the fruit so much they sometimes sneak into people’s yards to pick it. Adult males fight with each other to win a mate. Sometimes they are seriously hurt. Orangutans are very smart. They use tools, such as sticks, to scratch their backs, get insects out of trees or break open nuts. Some orangutans use leaves as napkins to wipe their faces. Others make ponchos or umbrellas out of large leaves. Orangutans are deep thinkers. They watch and observe before trying out solutions to problems. Orangutans have watched villagers untie a boat from a dock to ride in. Later, they untie the boat and go for a ride themselves. Orangutans are very smart and clever. A video documentary about a smart orangutan that acts like a human. Question: What are a male’s flanges for? Answer: To attract females. Also, during fights, males bite the flanges or ears of their opponents. Question: What color are orangutans? Answer: Most apes are black, but orangutans have long, dark red fur. Question: What is an orangutan’s natural predator? Answer: Unfortunately humans cause the most harm to orangutans by burning and destroying their homes. Enjoyed the Easy Science for Kids Website all about Orangutans info? Take the FREE & fun all about Orangutans quiz and download FREE Orangutans worksheet for kids. For lengthy info click here. Declan, Tobin. " Orangutan Facts for Kids ." Easy Science for Kids, Apr 2019. Web. 23 Apr 2019. 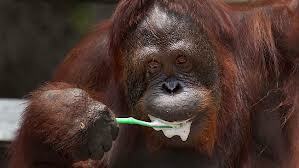 < https://easyscienceforkids.com/all-about-orangutans/ >.